A boat bobs up and down on the water, its occupant still except for an occasional inquiring tug on the fishing line. On the lakeshore, a deer looks cautiously from side to side before bending its head to the water to drink. In the distance, a house sits atop a hill overlooking a lake, while cows graze on a fertile green field between the building and the water. The sounds of a city hum in the distance. Everything in this scene is tied to water. Water is essential to our lives, but in addition to drinking water we use it for many other purposes – to grow crops, keep bodies, clothes and dishes clean and run industries. We play in the water, swimming, fishing, canoeing, boating, jet skiing, scuba diving. And of course we share the water with all the teeming life on earth that needs it as well – birds, mammals, fish, insects and plants. Water slips through our fingers, yet over the course of time it carves canyons. We cannot survive long without water, yet too much of it can devastate cities and destroy coastlines, as we have seen in recent years in Southeast Asia and New Orleans. And as human beings living in the United States, we tend to take water that flows from our taps for granted – until there isn’t enough to go around. Then, finally, the question of who owns the water arises. Historically, the law has ignored the geology of ground water and focused instead on personal property rights – the right of a person to do what he or she wishes with the water on the land, regardless of the harm to neighboring tracts. However, in the case of ground water, American courts have modified this finding to one of reasonable use, said Phillip Norvell, professor of law. Under the reasonable use clause, a person can draw all the water needed for use on the particular tract of land in question – be it for municipal use, crop land irrigation or to provide water for a subdivision. But often the question of what constitutes reasonable use comes under dispute, and in Arkansas, there have been different interpretations of reasonable use, with some courts applying the same criteria to ground water and surface water, and other courts arguing for each land owner to have a proportional right to the water underlying the land. Into this confusion drop problems that current ground water law does little to address. Agriculture in eastern Arkansas illustrates the issues at the forefront of water use nationwide. The Grand Prairie Alluvial Aquifer in eastern Arkansas has been a main source of irrigation for crops since 1904, making that region one of the largest producers of rice in the United States today. In the 100-plus years since then, the signs of trouble with the aquifer have started to appear. Compaction of the soil has made re-charging of the aquifer increasingly difficult. Salt water has begun to intrude where none appeared before. Every day, it costs the farmers in the region more to pump fresh water onto their land. And as the water becomes scarce, the farmers begin to seek other means for irrigating their fields. The U.S. Army Corps of Engineers estimates that the aquifer will be too small for commercial use by 2015. “The old common law has nothing to say about this,” Norvell said. 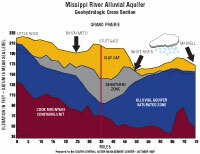 In 1991, the Arkansas legislature passed the Arkansas Ground Water Protection and Management Act, which allows the Arkansas Soil and Water Conservation Commission to designate “critical groundwater areas.” However, the act is complicated, requiring a permit system that applies only to high capacity wells. Wells in existence are entitled to “grandfather rights,” which may enable them to continue to draw an equivalent amount of water to that which was withdrawn on average in the past three years. The act has done little to stem the flow of water out of aquifers. Like ground water, surface water rights have their own complicated history in Arkansas. The Arkansas state legislature passed Act 1051 in 1985, which gave the Arkansas Soil and Water Conservation Commission a mandate to inventory surface water resources and to determine water needs for fish and wildlife, navigation, city use, industrial use and agricultural use. The commission also has the authority to allocate surface water as necessary during times of drought and shortage. And the commission can authorize “reasonable” transfers of “excess surface water” to entities that do not have the water on their land. Such is the case with the Grand Prairie Area Demonstration Project, funded mainly by the federal government and implemented by the Corps of Engineers, which would take water from the White River and pump it into holding tanks on farms in the Grand Prairie region to allow the aquifer to re-charge while farmers continue to grow rice. Pump stations are expected to be online in 2007. However, controversy surrounds the project, which some people believe will deplete the White River of necessary water – especially in times of drought, which has been the case in Arkansas for the last three years. 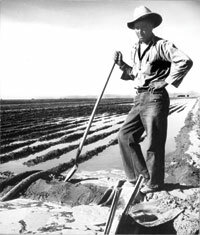 This Mexican irrigator, photographed in 1940, is working to prepare a field for flax. Historic water practices have lowered water levels in aquifers and created a landscape vulnerable to drought, causing pressure among different groups who want to have rights to the water. “The problem is, drought exacerbates the lack of surface water resources,” Norvell said. This could mean difficulties if there is a lack of water for both the river and the aquifer. The right to use surface water under what is known as the riparian rights doctrine requires that the users own the tracts of land they use the water from. This presents many problems today, Norvell said. “Limiting use of surface water to certain tracts isn’t conducive to efficiency,” he said. Plus riparian rights fail to take natural factors, like drought, into account. Norvell sees the issue with the Grand Prairie Aquifer, as well as issues like it, as an indication of a larger problem in want of a solution. “We need a water code – a unified system to deal with ground water and surface water,” he said. Norvell was involved in writing a draft of a unified code in the 1980s, but the draft did not go far. “No one wants their rights restricted,” Norvell said. However, prolonged drought may eventually force the issue, creating the need for a permit system that can help people deal with water shortages and prevent environmental harm. “Water is peculiar. It involves private property rights, but is something the public has a great interest in,” Norvell said. In Western states, water rights appear to be evolving from a private to a public issue – something that may well be headed in this direction.